Today, we’re announcing the unrealized return for all 2013 syndicate investments is a 46% IRR and 2.4x multiple. Learn more. These returns are in the upper top quartile of 2013 VC and PE funds, according to Cambridge Associates, the industry standard for measuring VC returns. These returns are after fees and carry. They are marked to the end of 2015. They are unaudited. They are unrealized — it takes 5–10 years or longer to realize significant returns in venture capital. And they are calculated with an industry-standard technique of marking valuations to the latest round led by an outside investor. Although unrealized returns often go down over time, these numbers indicate that syndicates may be a great way to invest in high-quality startups. Today, we’re also announcing the Access Fund, the easiest way to invest in 2017 syndicates. A single investment in the fund will target hundreds of the best syndicate investments, selected by a team of experienced investors at AngelList. That’s simpler and less risky than picking individual startups. Many of the fund’s investments are simply not accessible to individual investors because they are private deals in syndicates that rarely accept new investors. Finally, the Access Fund doesn’t charge any additional fees or carry. Learn more about 2013 Returns, invest in the Access Fund and read about A-List, the premium recruiting product we also announced today. For your pleasure, we highly recommend this interview about today’s announcements with AngelList founder and CEO, Naval Ravikant. Syndicates allow investors to co-invest with top angels and VCs. 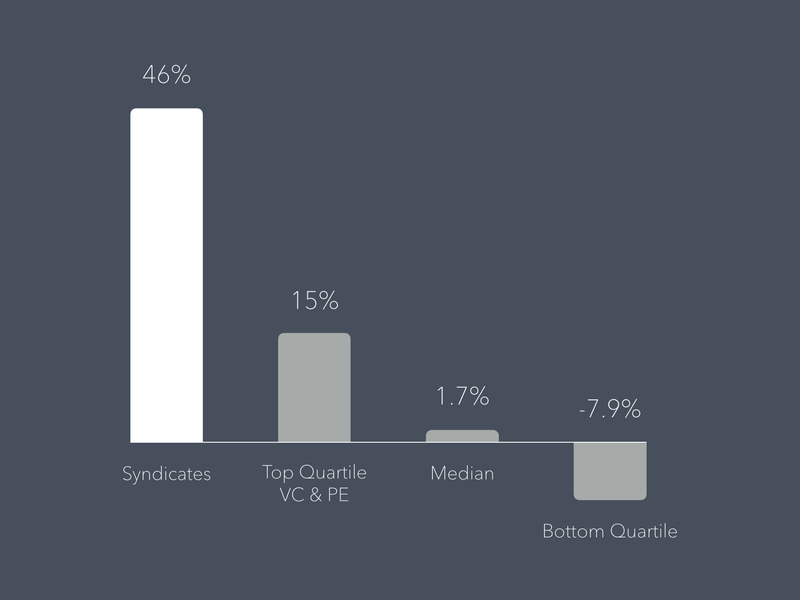 Syndicates have invested $425M in over 1000 companies, with $2.9B in follow-ons. There are over 200 active syndicates investing across all stages, with an average investment of $390K. Past performance is not indicative of future returns. There is no guarantee that the Access Fund will achieve the same exposure to or quality of portfolio companies held by any existing AngelList funds. An investment in venture funds, including the Access Fund, involves a high degree of risk and is suitable only for sophisticated and qualified accredited investors. Please request and review the formal offering documents of the Fund for full details regarding risks, minimum investment, fees, and expenses. Terms described above may be modified in the sole discretion of AngelList Advisors, LLC, the investment advisor of the Access Fund. Originally published at blog.angel.co on September 15, 2016.